I found this two prong white electrical connector unplugged (see picture; located just right of the engine fan) on my newly purchased 2003 Porsche 911. It appears to plug into the connection located behind the rectangular black box adjacent to it. Could someone please tell me what this connection is for and why someone would want it unplugged (assuming there is some reason other than someone unplugged to do something and forgot to plug it back in)? I just thought I should know what its for before I plug it back in. I did search, but couldn't find an answer - much thanks for your help. Does this car have an Aerokit read spoiler or other fixed wing spoiler? If so, then the connector is not used. Sorry, can you tell me the number of wires and the color code of each wire? I am uploading a close up picture (see attached), but there are two wires. One is brown which I assume is the ground and the other is red/light purple striped. Just to clarify one wire is Red/Light Purple or Blue and the other is not solid brown. I think the other is Brown/Red. 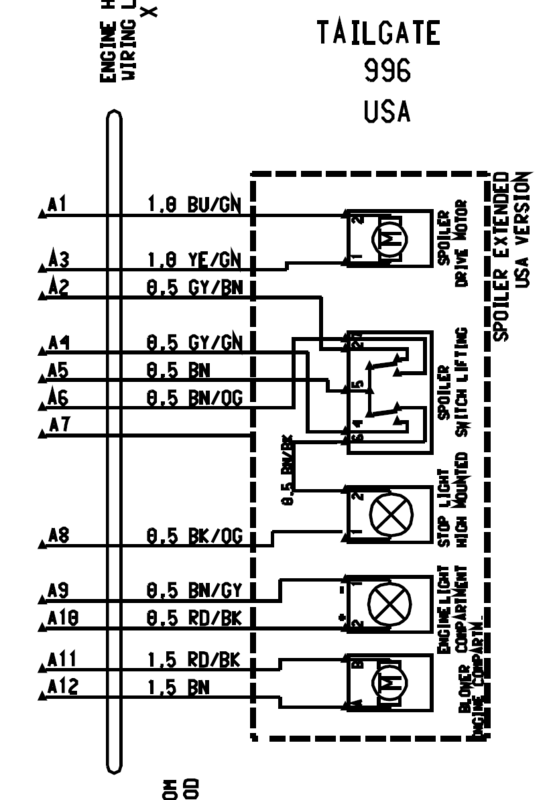 Loren - based on your wiring diagram it does not appear to be related to the spoiler. Could it be something else tail gate related? Third brake light, engine fan, etc. Happy to supply more pictures if that helps. If your third brake is in the spoiler then yes - if your third brake light is in the back window then no. I have done some more searching and think the wiring colors may be consistent with the engine compartment lamp - does that make sense to you? I think this is for either the third brake light in the spoiler, or more likely the engine compartment light. The spoiler light is only activated when the spoiler is in the raised position. The engine compartment light should come on when lid is open. Alternatively, it could be the emergency speed brake parachute release connector. Chute deploys at hard braking from above 145mph. It's the engine compartment light connector. thought it was the light connector. My inde relies on me to remember to plug it back in. It was the harness for the engine lamp. Plugged it in and it works.